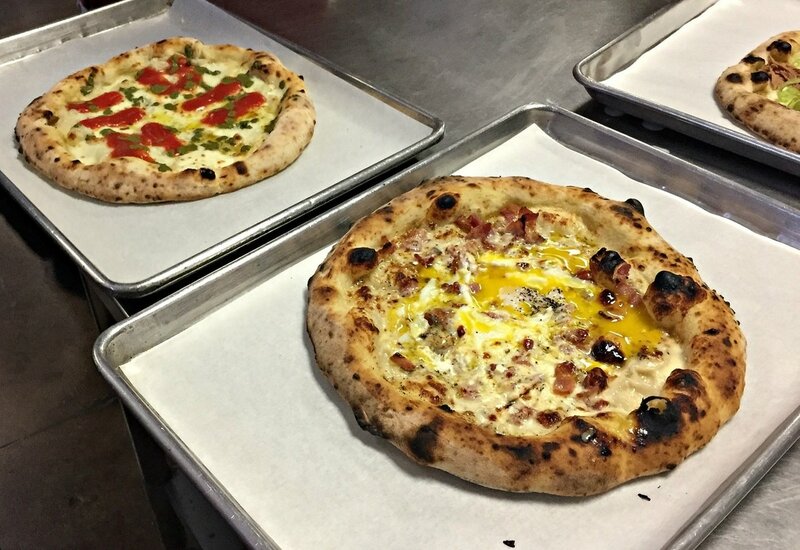 When the best pizza maker in the world comes to LA, it stirs up quite a buzz. 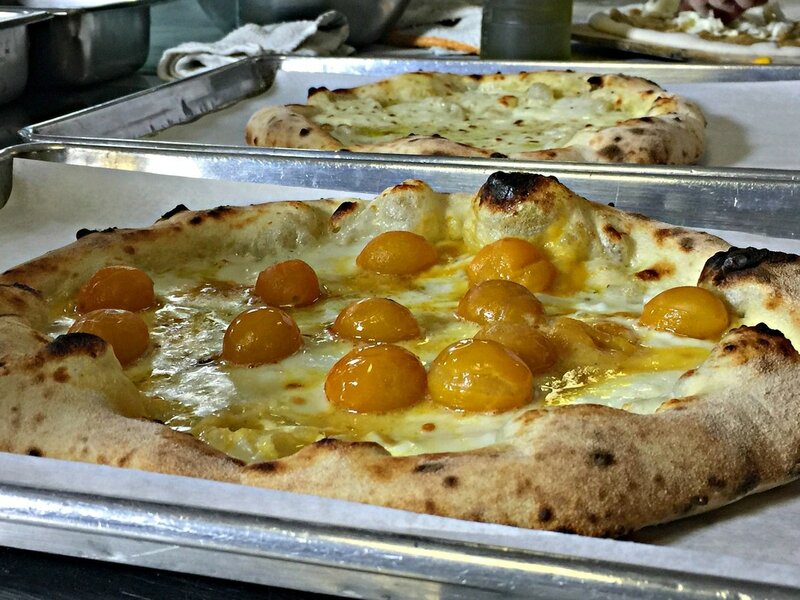 Especially when two beacons of Los Angeles’ culinary scene, Chef Nancy Silverton of Mozza fame and Los Angeles Times food writer Jonathan Gold attest to just how great this pizza is! 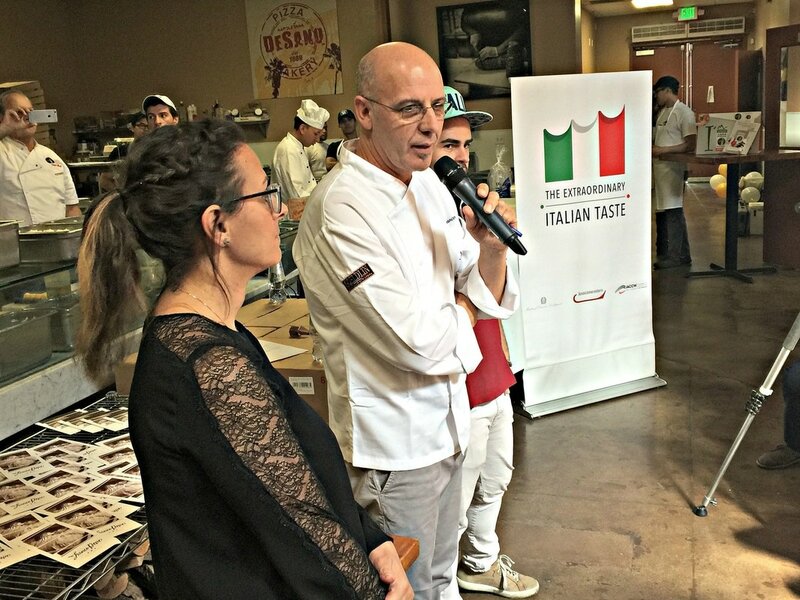 Sponsored by the Italy-America Chamber of Commerce West, Silverton and Gold introduced Franco Pepe, master pizzaiolo, in what was billed as an “Extraordinary Italian Pizza Day”. Pepe, flanked by Naples-born pizza artisan Daniele Uditi and other pizza maestros from the Associazione Verace Pizza Napoletana, conducted a master class, and revealed the secret to what makes his pizzas stand out on the world stage. 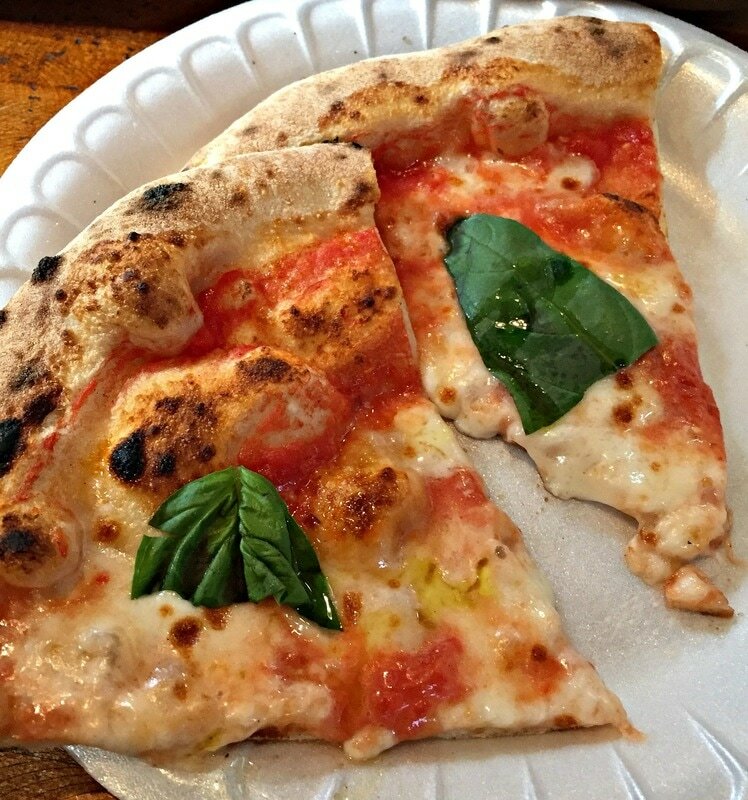 In the City of Angels, where pizza joints seem to be on every corner, over a hundred pizza lovers converged upon DeSano Pizza Bakery in East Hollywood, jonesing for a slice of what top food critics have crowned the king pie of the world. Just like in wine, to make the best, you have to start with the best. Quality ingredients make for authentic pizza, something that Franco Pepe takes very seriously, in fact, so much so, that he brought his own from his hometown of Caiazzo, a small Italian town about an hour northeast of Naples. Pepe is a third generation pizzaiolo, and although he worked under his father in the family pizzeria, he aspired to take pizza making to the next level. As Pepe realized, the true art of pizza was in the dough itself. 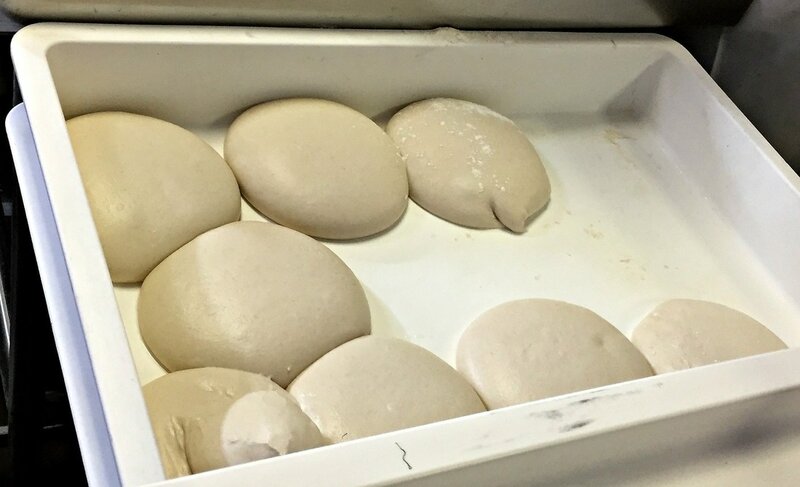 Tirelessly experimenting with the flour, water, and yeast that go into the dough, he developed techniques that brought out a “perfect mix of aroma, flavor, and lightness”, but then realized that the ingredients themselves needed to be special. So he reached out to his community, farmers and agricultural specialists, and collaborated on resurrecting heritage grains and other products, which brought a vibrancy to his pizzas. 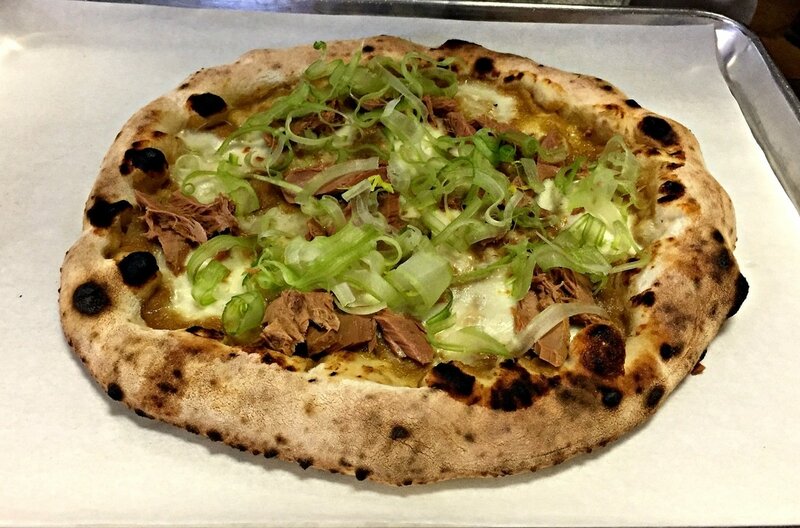 Pepe opened his own pizzeria, just a short distance from the family restaurant, and since then, hundreds of people nightly make the pilgrimage to Pepe in Grani, waiting hours for the chance to savor Pepe’s pizzas. 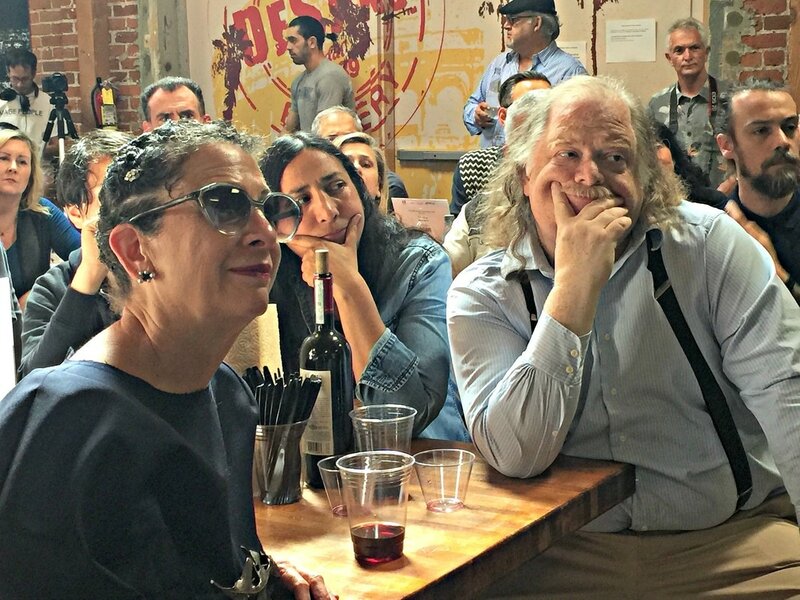 Nancy Silverton made such a journey to Caiazzo, at the urging of her good friend, Italian food expert, Faith Willinger, and was so impressed with Pepe’s pizzas, she convinced him to tour the US, starting with Mozza a couple of years ago. She confided to the crowd, “I don’t eat pizza, I don’t eat carbs”, but confessed to eating Pepe’s pizza, “I think I ate myself, four of his pizza”, making an exception for “extraordinary pizza”. She thinks the secret goes beyond the crust, “What makes Franco’s pizza extraordinary is not only is his crust, that he kneads every single night by hand, after he closes the shop where he served over 500 pizzas, but it’s so extraordinary because what he puts on top, what he sources locally is so far better than anything that we have available to us.” It’s this devil in the details, an obsession with near perfection in all aspects of the process, that sets Franco Pepe apart, whether it’s a nod to tradition by hand-kneading the dough, and only baking the pies in a wood-burning oven, or keeping an open mind to modern technology and sensibilities. Silverton noted that pizzerias, once the lowest common denominator in Italy, are evolving, thanks to Pepe, whose passion and dedication have propelled pizza-making to an art, with Pepe in Grani at the helm. 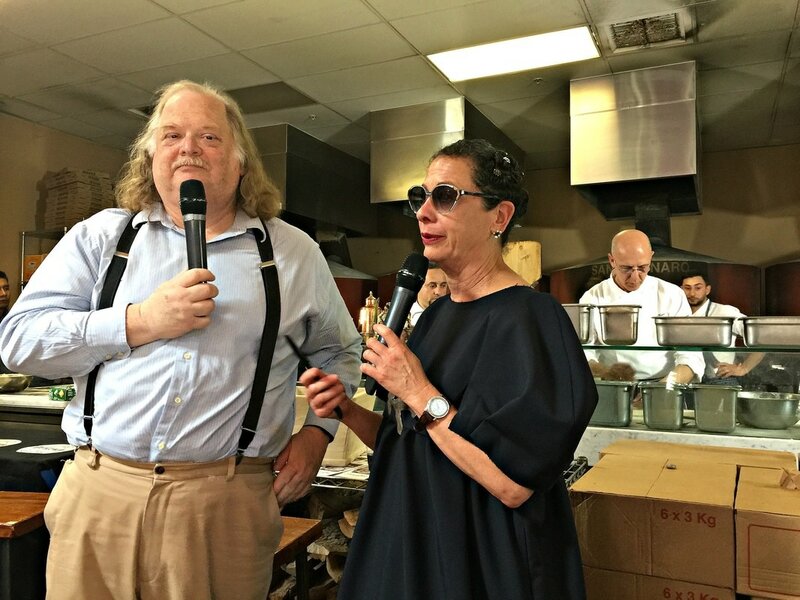 Jonathan Gold is also a fan. He, too, made the journey to Caiazzo, encouraged by his good friend Silverton, to experience the maestro in person. “You know, whenever anyone tells you this is absolutely the best in the world, your attitude is usually OK, make my day!” Gold laughed. But he was intrigued, and found himself in front of Pepe’s pizzeria, waiting for three hours to be seated. “What occurred to me, the second when I ate Franco’s pizza for the first time, it’s not just the crust, it’s the marriage between crust and sauce”, he said, “you don’t know where one starts and the other leaves off, the crust and the pizza feel almost alive in your mouth”. Gold continued, “There’s a chewiness, but there’s a suppleness, the crispness is almost tender rare, because the pizzas are in and out (of the oven) so quickly, in some ways unlike any pizza you’ve ever eaten.” He was impressed with the flavor, which comes from the infusion of top quality ingredients, such as the plump San Marzano tomatoes, creamy bufala mozzarella, and fragrant basil olive oil, atop a thin crust dough, all sourced from the immediate area around Caiazzo. 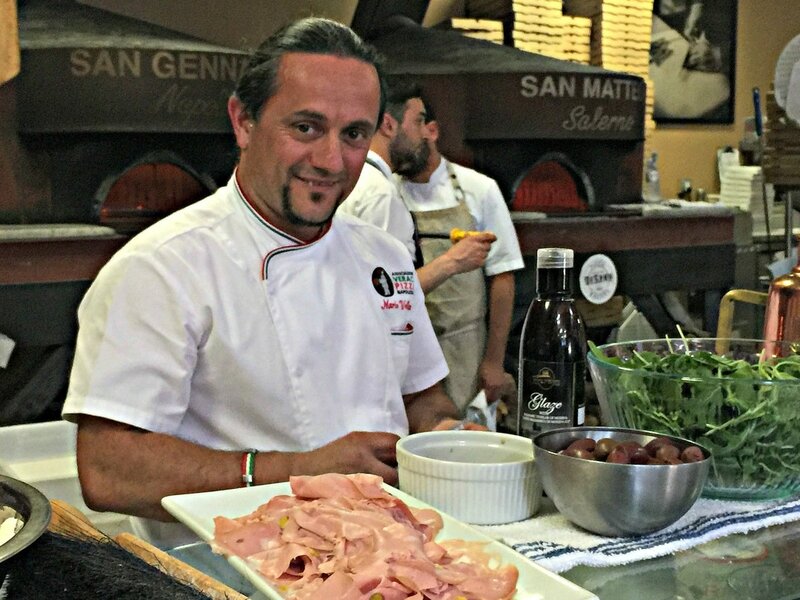 Pepe spoke through a translator during his pizza master class, and with the assistance of a video presentation, he revealed his secrets slowly, but no worries, this is not something that can be easily duplicated. His focus? “Healthy and quality”, something in vogue right now, growing the best quality ingredients while helping the environment. A crucial part of his success is the texture of the pizzas, going beyond just the crust. Pepe started experimenting with Pizza Margherita, instead of putting all the ingredients on the crust and baking it together, he just baked the crust and the cheese. Then when he pulled it out of the oven, he added the fresh tomato, an interplay of warm and cold, cooked and raw, that was drizzled with a strong basil reduction olive oil made from local herbs. And the same with all his other pizzas, they are alive, bursting with the flavors of the individual toppings, placed fresh on top of the pies. And so the pizza extravaganza began. Dozens of pizzas were tossed, baked and topped at a furious pace for the hungry crowd. 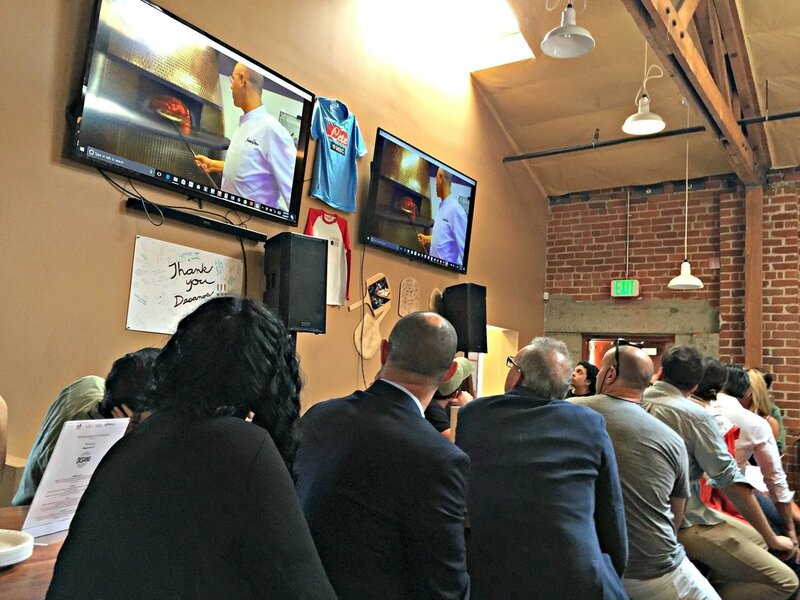 DeSano’s four large wood-burning pizza ovens, imported from Italy and named after Italian saints, were cranking, as Peppe Miele, Mario Vollera, and Augusto Folliero of VPN Americas, Daniele Uditi of Pizzana, Franco Pepe, and DeSano's own pizzaiolos made their specialties. Pizzas on sheet pans were carried out to anxious pizza lovers, seated at large, communal tables. So many varieties, some were Pepe’s masterpieces, the other creations were from the rest of these talented pizza makers, all incredibly delicious, from the humble Marinara to the grand Sfizio ai Pomodori, two cheeses, Grana Padana and Mozzarella, and two tomatoes, yellow tomatoes baked on the crust, with sun-dried cherry tomatoes added after. 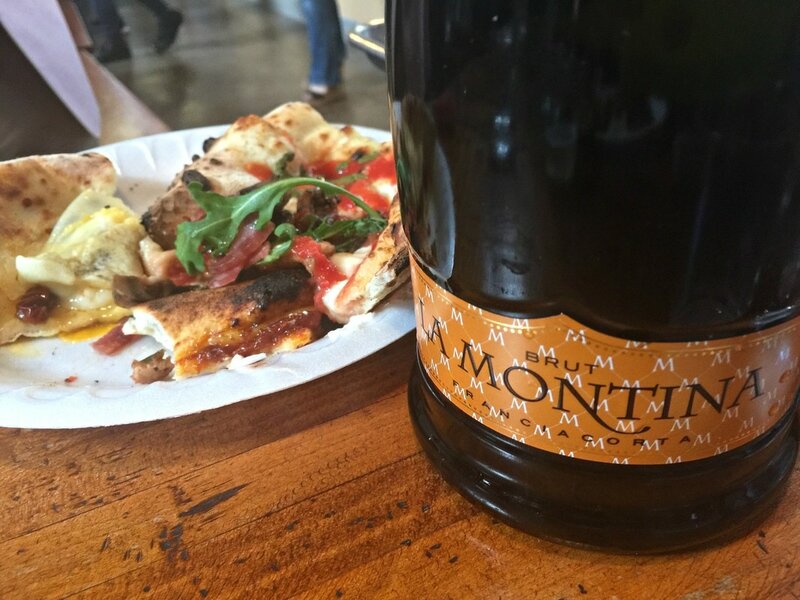 And the surprises didn’t stop there, glasses of sparkling La Montina Franciacorta Rosé and Brut were poured by Paolo Cressi of Vino Direct, which proved a worthy companion to the richness of the pizzas. 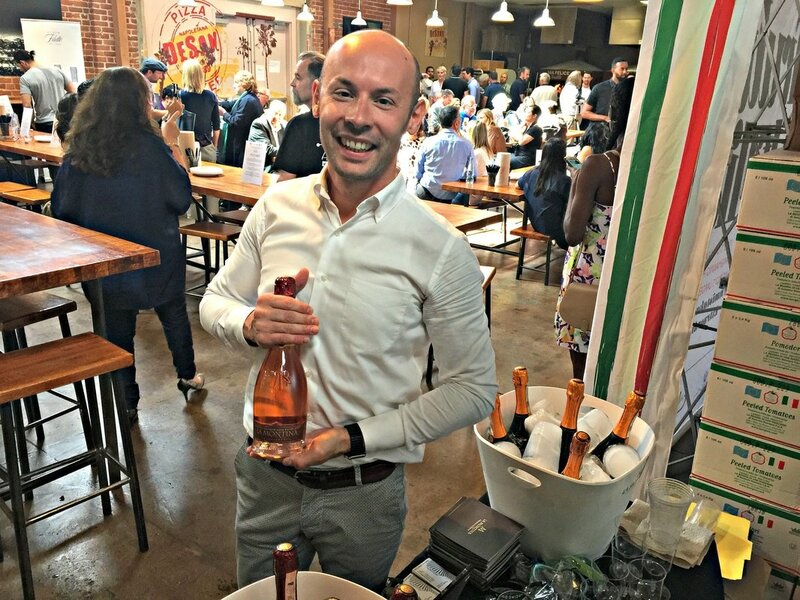 It was a heady afternoon, a celebration of the best of Italian culture, excellence in food and wine along with a joy for life, with many Italian expats in attendance. 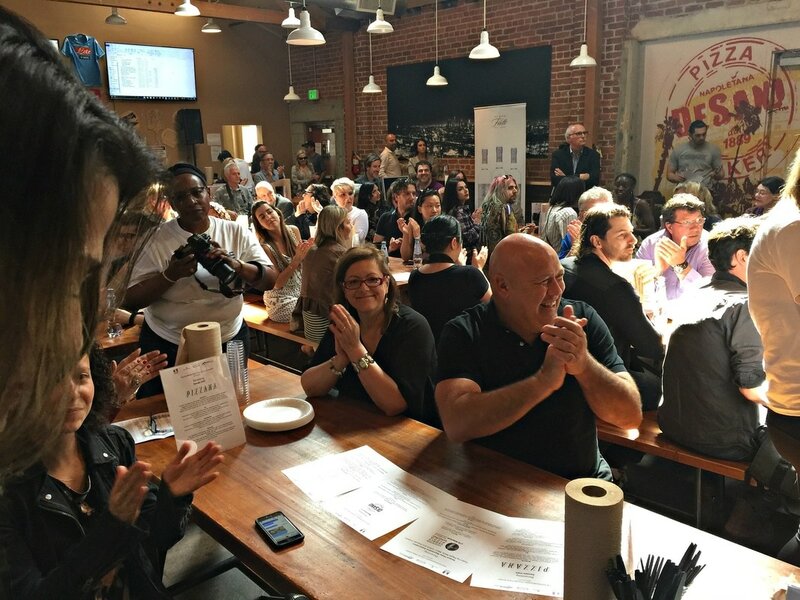 It was all part of the exploration of the Extraordinary Italian Taste in Los Angeles, a series of monthly events that spotlight the authentic products of Italy, what we all love most, their food and wine. La Dolce Vita!